You’re never quite the same after a memorable road trip. Curiosity can seize you on a trip, yes, even on a business trip. The 2018 Global TapRooT® Summit is in Knoxville, Tennessee. You have some free time to wander. Time to check out the life and lifestyles. Make new contacts or new friends. Put on a foodie hat and eat like a boss. Pick up souvenirs. 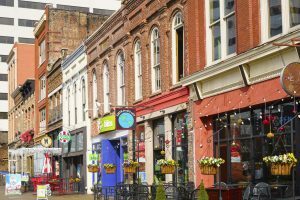 Here, in Knoxville, we invite you to open yourself up to a city that brims with sporting events and nightlife, artists and art, live music and concerts, Broadway performances. Take advantage of our region’s breathtaking scenic drives and take a hike to immerse yourself in spectacular natural beauty. Experience an embarrassment of foodie havens, some mighty fine shopping, and the warmest Southern hospitality around. Save time to sample our downtown winery and distilleries, and hop on a Knox Brew Tour. Here’s a smattering of suggestions for exploring and good times. 1. Knoxville Visitors Center, 301 S. Gay St., Knoxville, TN 37902: This building dates to 1925 and besides information about our fair city, you’ll find award-winning WDVX and its famous Blue Plate Special. Here’s where to park, sorted by location.